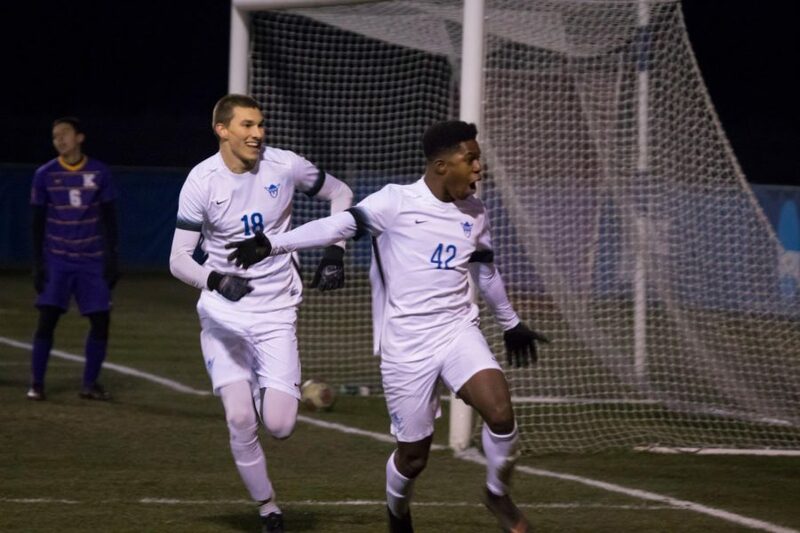 Ben Keller (‘20) and Faydane Ouro-Akondo (‘22) celebrate after Brunno Colon ‘s (‘19) overtime goal against Knox College on Saturday, Nov. 10. Luther Men’s Soccer defeated Knox College 1-0 in overtime in the first round of the NCAA III National Tournament at home on Saturday, Nov. 10. Luther followed the win with a 3-2 home victory over Dominican University in the second round of the National Tournament on Sunday, Nov. 11. These two victories put Luther into the quarterfinals of the National Tournament for the first time since 2011. 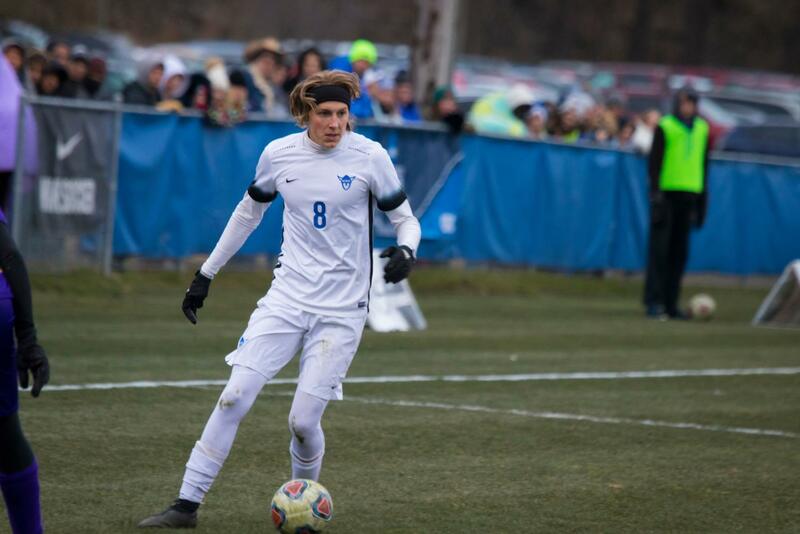 According to midfielder Logan Morrison (‘20), Luther wanted to maintain their style of play going into the national tournament. In the first match Luther had 14 shots with five on goal, while Knox had one shot on goalkeeper Carson Davenport (‘21). Brunno Colon (‘19) scored the only goal assisted by Faydane Ouro-Akondo (‘22) in the 97th minute off a pass from the left corner of the box. Colin Hughes (‘19) dribbles the ball in the first game against Knox College. Ouro-Akondo said that Luther was excited to defeat Knox, but the team could not enjoy the win because of the quick turnaround for the next round. In the game against Dominican, Ben Keller (‘20) gave Luther a 1-0 lead in the fifth minute off an assist by Colin Hughes (‘19). However, Luther found themselves down 2-1 going into halftime after Isaac Perez and Jonathan Hernandez each scored a goal for Dominican. 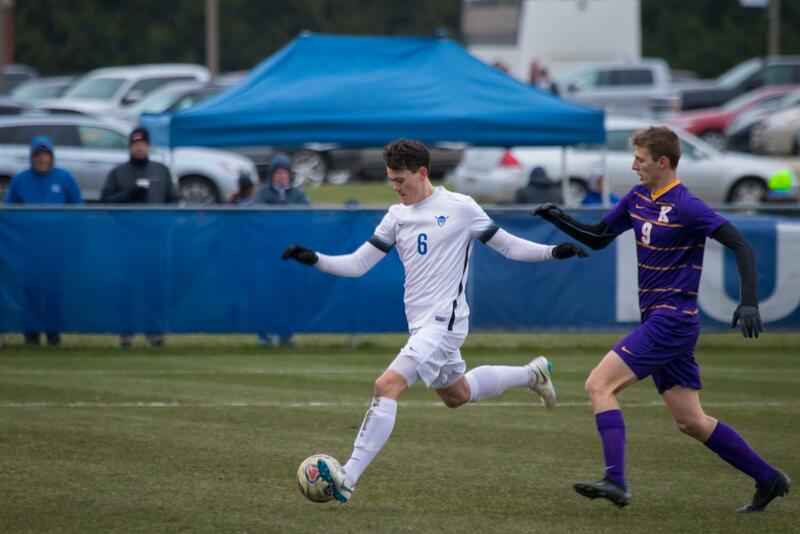 Harry Mertz (‘20) kicks the ball during the second round of the NCAA III National Tournament against Dominican University. After halftime Aidan O’Driscoll (‘19) tied the game with a goal in the 76th minute off an assist by Keller. The score remained tied until the 88th minute when Colon gave Luther a 3-2 lead. This was Colon’s fourth game winning goal of the season, which was assisted by Rafael Broseghini (‘19). 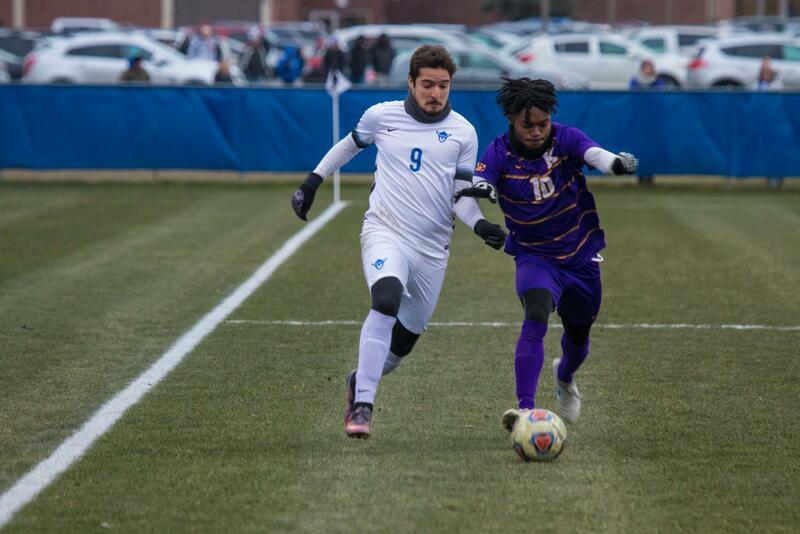 According to Head Men’s Soccer Coach Chris Garcia-Prats, Luther’s 13 seniors stepped up in the last game in order to continue the season. Luther will travel to Chicago to face St. Thomas University in the quarterfinals of the NCAA III National Tournament on Saturday, Nov. 17. After the weekend’s success, Garcia-Prats was confident going into the match against St. Thomas. Brunno Colon (‘19) challenges Adetayo Oluwasegun of Knox College for the ball. Earlier in the season Luther beat St. Thomas 2-1 in an away match on Sept. 18. Ouro-Akonda acknowledged Luther’s close victory over St. Thomas, but was confident about the upcoming match.